The Mini MBE is ideal for applications where the substrate size is small. The unique growth chamber can have up to 16 sources. These source positions are grouped in four water or LN2 cooled modules. Each of the four modules is separated from the growth chamber with a gate valve. The Mini MBE is a compact system taking the minimum amount of laboratory space. Although small in size the Mini MBE is fully equipped with necessary components for high quality epitaxy. Various pumping configurations are available including, turbo, ion and cryo pumps. Mini MBE with direct load lock. 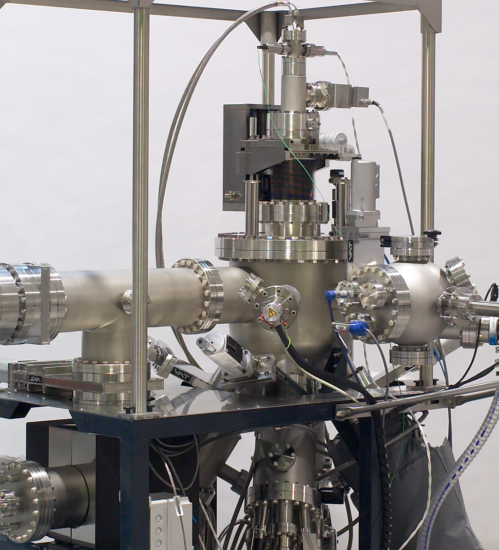 The system can be delivered with an optional small volume UHV buffer chamber.